March 22, 2018 | -by: Kevin George. Email marketing is highly effective and email engagement drives conversions and boosts sales, no doubts about that! But, email marketers often send too many emails while trying to engage the subscribers, they ignore the reality that many of them are ignored by their subscribers. Engaging subscribers efficiently is one of the major challenges that email marketers face today. According to a survey conducted by Campaign Monitor, increasing customer engagement rate was the number one goal for 58% of the email marketers surveyed. In the recently held The Best Email Design Hunt 2017, we received great email designs as entries and while we were analyzing the participating emails, the amazing campaign results from the Scottish media giant STV, caught our attention. We got into a conversation with STV’s Email Marketing Executive David Handling to learn about the story behind the email and the entire campaign. Read on to know how this Scottish TV channel saw an increase in the open and click-through rates by almost double. First of all, let me tell you, STV is not a client of EmailMonks. STV is a television channel based in Scotland. Interestingly, STV sends 3 million+ emails a month, which are all very targeted sends based on user interests and past behaviors. They also have 6 individual newsletters which users can sign up to. 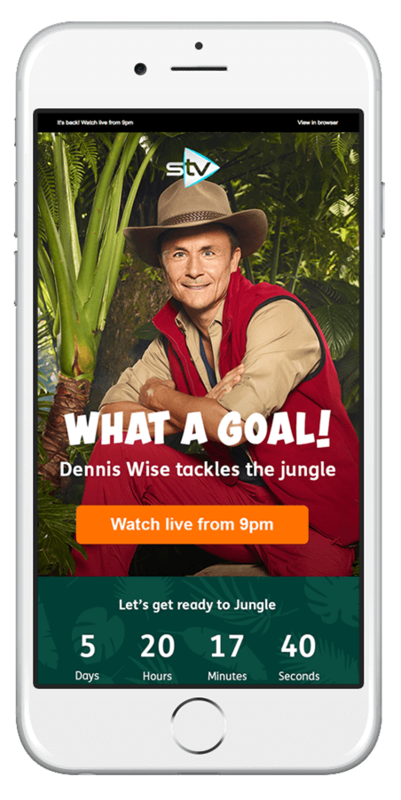 The aim of the campaign was to promote the new series of “I’m a Celebrity Get Me Out of Here” and push viewers to either watch the show live or catch up later. “I’m a Celebrity Get Me Out of Here” is a widely popular show. So, the public know when it is on each year. This time, we wanted to peak their interest in a new way. STV wanted to target as many users as possible through their email campaign, but in a way that made it interesting and personalized for them. They wanted to ensure that they don’t annoy their users by sending them content which is in no way related to them or their interests. They harnessed the behavioral data of the users on their STV Player to track what people watched. The list of celebrities participating in the show was known, and hence they clubbed this data together to segment their email list. Last year viewers: Users who watched this show last year, as it was evident that they like the show and would be well received. This list got an email showing off all the celebs that participated in the show. 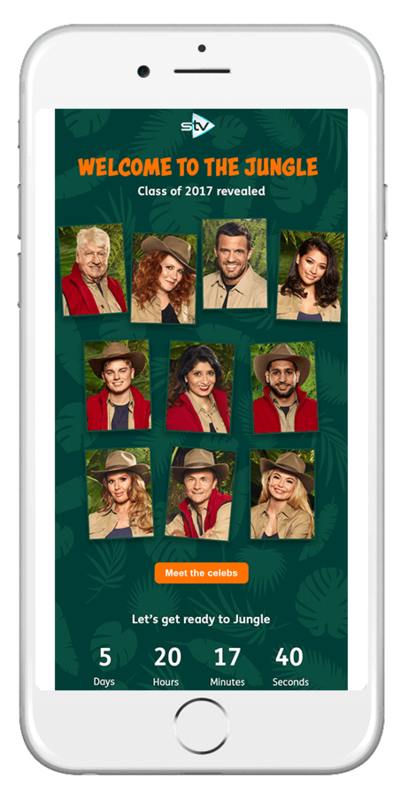 Subject line: I’m a Celeb is back – see the full line up here! Soap Fans: Jennie McAlpine (Fizz from the British soap opera Coronation Street) was going to be in the show. So STV emailed users who they knew watch Soaps, and will therefore, know of Jennie, telling them that she was going to be a part of the show – to get them interested. Sports Fans: Dennis Wise (Ex Footballer) was also a participant of the show. So, they emailed users who had watched football on the Player before (World Cup 2014, Euro 2016, International Friendlies, etc.) with a subject line and creative to support. Entertainment fans: Toff from Made in Chelsea was going to be in the show. So, they emailed users who watch entertainment shows (X Factor, Britain’s Got Talent, Ant and Dec’s Saturday Night Takeaway, The Voice, etc.) to grab their attention. 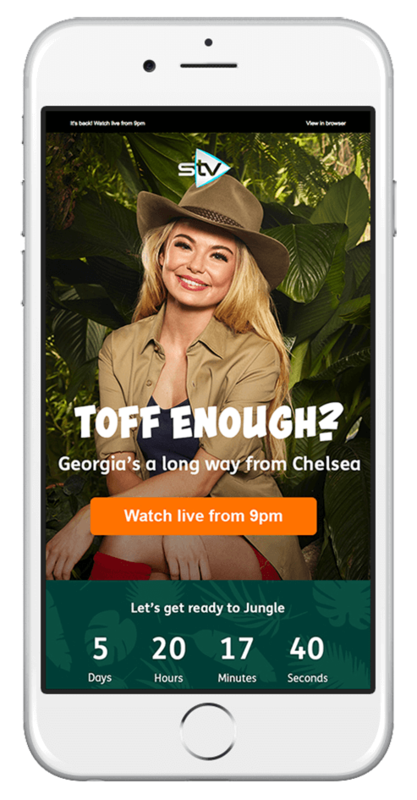 Subject line: I’m a Celeb: Is “Toff” tough enough? The EMAILS were part of a larger marketing campaign for the show that comprised of emails, digital adverts, and social media material. 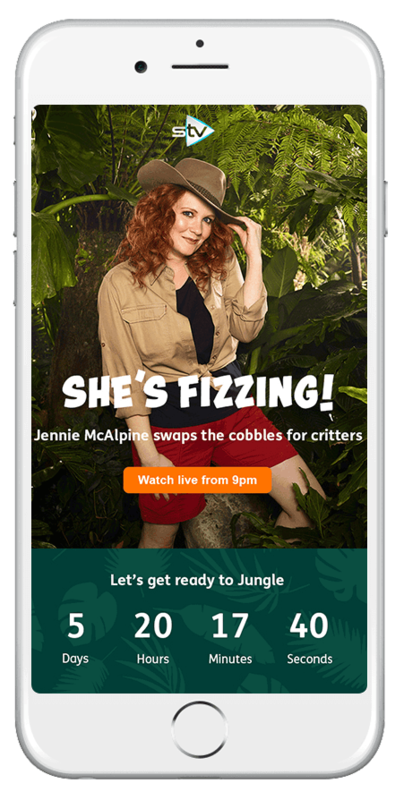 Considering viewers are familiar with the show, it was important to generate new excitement and for that, Zoe Perry, Graphic Designer worked towards creating a distinct look and feel for their email campaigns that were also carried across different formats. This involved developing a custom style for the campaign, using a punchy jungle themed font and a two-color palette of dark green and vibrant orange. The flat silhouette illustrations were designed to be used as background patterns. They continued the jungle feel without taking over the design and provided a flexible set of assets to use. Across the emails, the main feature is the celebrity imagery, because that’s what viewers want to see. STV knew that the show may not be for everyone, but they took an approach that helped them reach out to as many people as possible, i.e. by using a character they knew the users are familiar with. This strategy helped them to garner their subscribers’ interest and they have successfully demonstrated that this is a way to drive streams (and consequently revenue). STV team always measures their email campaign success on the Benchmark for the Media sector, which is 19% Unique Open and 2% Unique Click, according to IBM Email marketing benchmarks 2017. Over the entire campaign, they had a unique open rate of 31.4% which is way above the industry average of 19% and unique click rate of 3.5%, again over the benchmark of 2%. But what was most surprising is just how well the Sports list did. I’m a Celebrity Get Me Out of Here is a reality programme, those types of shows are mainly watched by Women and as per STV team, Sports list was mainly men but it, in fact, did the best in terms of opens with 35% Unique Opens. Here, STV made effective use of the available user’s behavioral data by segmenting them into different groups and targeting them with different and unique emails. The metrics of this campaign shows that behavioral segmentation brings endless possibilities to boost open rates and click rates, when done right. By keeping a track of how your subscribers/customers behave within your site or portal and leveraging the data will help you in creating relevant and targeted email campaigns that they will be most likely to engage with. Group users with same user behavior or interest together and call it a segment. Now, create different emails for each segment with relevant content, design and subject lines. When the emails are relevant to their interests, they are more likely to open and click-through, thereby boosting the engagement of your overall email campaign and improving ROI of your business. Behavioral segmentation is a powerful tactic which when leveraged with the right amount of creativity and analysis can bring great results for your business. Analyse your subscribers and the various email segmentation strategies and determine what works best for your business.